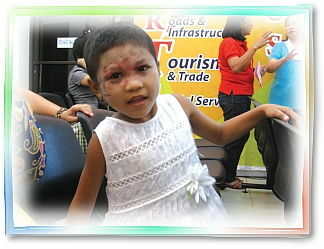 Virginia Rojo is a six-year-old girl living in Barangay San Jose, Sipalay City, Negros Occidental, Philippines. One day, while her mother and 9-year-old sister were out delivering laundry, little Virginia was at home sleeping with her infant brother Joren. Suddenly, she awakened to a house engulfed in flames. She immediately picked up baby Joren, and protecting his body with her own, ran out of the burning house. She later said, “Papa Jesus told me to wake up and save my baby brother.” Through her quick-thinking actions and bravery, her brother remained safe and sound. However, she was hospitalized with second-degree burns to her face and hands. On April 15, Golden Year 7 (2010), when our Association members visited little Virginia at a shelter, they were immediately taken by this sweet girl who hugged and kissed them like they were her family members. She appreciated all the vegan foods and toys brought to her and kissed Master’s photo affectionately. 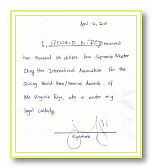 In addition to the Award plaque, Master also contributed US$2,000 to aid in Virginia’s recovery. More presents included a Heroine T-Shirt plus Master’s DVD’s and books. 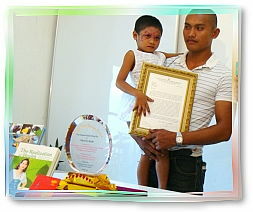 Virginia and her family were filled with gratitude at receiving the Award and gifts. They are currently building a new house to start a new life, and they said the funds would be a great help. 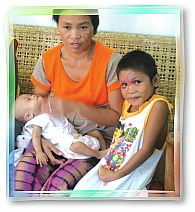 We salute your faith and courage, little Virginia, in your selfless actions that saved the life of your baby brother. Wishing you smooth sailing back to perfect health and God’s continued protection for you and your family, now and always.